Deep Betrayal by Anne Greenwood Brown. The Sequel to Lies Beneath. Review: Mermaids, danger, and family. All these details are in Deep Betrayal by Anne Greenwood Brown. In Deep Betrayal Lily and Calder are on another adventure but this time with her father. In the last book Lies Beneath Lily finds out that her father is a merman like Calder. Calder now must protect Lily and her father from his sisters- Maris and Pavati. They are looking for revenge for their sister's death. Once they learn that Lily is still alive, they grow even angrier. Now Calder has to be even more careful with Lily and her father because Maris and Pavati are looking for revenge. Eventually Lily and Calder go on a journey, a dangerous and exciting journey, looking for a magical creature. The culmination of the story is surprising and completely unexpected. Want to know the surprise? Read Deep Betrayal to find out what happens to Lily, Calder, and her father. I loved Lies Beneath but Deep Betrayal by far is even better. Just the details are amazing. Anne Greenwood Brown is such an amazing writer, she writes incredible stories about adventures and journeys. People who love reading about mermaids or danger will love this book and the entire series because it has a combination of adventure and mermaids. I would recommend this book to anyone because of all the action in this story. Deep Betrayal is a fiction . 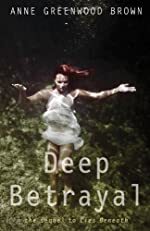 Overall this story is a great read and anyone that reads this will be in for a treat because Deep Betrayal is in my top 5 books that I have read. Review written by Skyler (6th grade student). We would like to thank Random House for providing a copy of Deep Betrayal for this review. Have you read Deep Betrayal? How would you rate it?